Akshat is a thinker who is passionate about technology, marketing and culture. He is particularly intrigued by how the new media and digital channels are transforming marketing, putting consumer in the centre of all action. Jutting off the edge of the mainland, Howth is a wondrous coastal town a few minutes off Dublin. A working harbour, panoramic-Irish Sea views, drop-by at W.B. Yeats (coastal?) home and an exhilarating and nerve-wrecking Cliff Walk along the raw terrain outlining the coast, makes it a worthy visit. In early November when I did the walk, midst the misty rain, criss-crossing the multiple “Dangerous Cliffs” signs, I wobbled between moments of excitement on seeing exhilarating natural heathland views and, minutes of anxiety treading down the moss-covered slippery terrain often giddily close to steep edges and dangerously abrupt heights. Lack of proper guideposts or safety railings and no sight of people added to the excitement (or was it fear? ), I continued on and I am glad I did because walking past abandoned cottages through weedy shrubs and purple bluebells, with the symphony of waves crashing on the raw rough sea crags I saw what perhaps would have led H.G. Wells to describe the view of the Howth Head as “one of the most beautiful views of the world.” The sun did not show up for the rest of the trip and I walked through the middle of the town to finish my walk, ecstatic and satisfied as I angled for a seat in the Fish and Chips stop outside the DART station. This method of arriving at the financial returns for changes in user experience has been doing the rounds recently. The writeup talks about how Amazon may possibly lose 1% in sales for every 100 miliseconds added to page load time. With all the data at one’s disposal it seems reasonable that one has been able to establish a relationship between sales and speed. While it may be easier to quantify and A/B test in this specific instance, there are multiple user experience initiatives where it’s not easy to measure interactions or the impact of change. In this light, I have been wondering how Apple would have worked out the business impact of changes in its font from Helvetica Neue to SanFrancisco Neue. Although it seems like a harmless change (because, in most cases, all functionality remains intact), and new users may not argue, old users will most definitely be rattled by the changes, because they have been used to using the same interface, with the same font, over and over again. While some decisions to change the typography (or font) are clearly led by rationale to make the type work for newer (and smaller devices) and offer better legibility, it also impacts users emotions in two ways. Serif fonts were originally used by the print press, as serifs are proven to help the eye move from letter to letter faster.When computers were first used, computer screens had low resolutions. Serif fonts had to be created using vectors, which just didn’t look right with the low pixel-density available back in the days. So, early designers defaulted to using sans serif fonts, which were created as bitmaps. While you may still have a hard time convincing your clients or your other team at work to make that extra investment in typography to improve the user experience, the fore-mentioned formula does help in arriving at the return of the UX investments. The method allows one to use the expected change in monetary value for every user interaction that the change in customer experience (or UX) development will arrive at for a user or a customer and then multiply the monetary value with the total number of customers impacted by the change while including the time period and the cost of development as other important considerations. As more and more touch points become enhanced with elements of technology, they become more measurable allowing organizations to improve customer journeys. However, as human behaviour interacts with new forms of technology it often conveniently arrives at methods and ways of interaction which no one perhaps would have thought through at the stage of inception or development of the technology and its manifestations in the form of devices. I wonder if Apple at the time of developing the Watch would have thought that more than half of the users would use their nose to interact with the device! But then such are the intricacies of human behaviour which in turn makes improving user experience as much a science as it is art. So it appears now one can apparently wish a friend happy birthday on Facebook just by typing a “1”. This is awesome, scary and undoubtedly the future all wrapped up in one little text-based payload. Because typing “happy birthday!” means typing thirteen more characters than typing “1”. But it also means loading Facebook and loading that friend’s profile page. Clearly, Facebook is doing away with the barrier to interaction. Which leads to the question: at what point do bots start talking to bots? You know, why should you have to type “thank you!” when you can reply to a text with “1”? Or better yet, why should you have to type the “1” at all? If Facebook knows you want to say “thank you” to everyone (bots included) who wished you a happy birthday, shouldn’t they just give you the option to let Facebook do that for you on your behalf? And that leads to the idea of having Facebook automatically say “happy birthday” to a friend on their birthday each year. If you can do that and then the Facebook “thank you” bot can reply to the “happy birthday” bot, we would have some hot bot-on-bot action. While we are figure our communication niceties, it appears completely paradoxical to me that while we let Facebook take over the simple task of wishing someone happy birthday, we do not trust its choice of content or music for us. There is enough and more that has been seen and heard about the algorithm that powers the Wall and decides to show what we may want to know at that point of time based on our interest or Spotify whirling down the its endless cycle of songs in the shuffle mode like a Ferris wheel based the artists that one has chosen. David Bryne who is curating the Meltdown festival at the Southbank Centre in London has a thing or two to say about why us-humans beat any alogorithm hands down when it comes to curation. Why this insistent emphasis on choices and filtering now? It’s obvious: when everything is available, within reach, accessible, the problem becomes not one of scarcity but of abundance. Where to find, amid the glut, what is right for you? How to separate the music from the noise? Pre-internet (and before there was a host of world music guidebooks), I used to go to a record store in Times Square subway station and buy Latin records. Did I know anything about them? Very, very little. I was following vague clues – the cover graphics, the producer, the band members, the other artists on the same label. A risky way to find stuff, it would seem, but once you learn to read those clues, the odds are surprisingly good. And then this bit on how the social media platforms curate the content for us. Social media recommendations, of course, are a form of curation. The internet memes and viral eruptions, the algorithms and whims of the herd, sweep us along and these, too, increase the value of the things they recommend. Are they unbiased? Not so much. They’re often trying to sell you something, or gather information on you that they can then sell to someone else, so trust in that world is a rare commodity. I love Twitter where I spend a fair bit of time everyday and I shudder at the though of Project Lightning may do to it. I am the least bit surprised when Apple at the launch of Apple Music tom-toms about DJs who will man the internet radio or Twitter, Linkedin and Apple going out and looking for human editors to curate news and content for us. More choice is always good. Or imagine going to a library and finding books by the same author again and again or sitting infront of a national television broadcaster as a sole television channel which decides what programmes we should be watching. However, the big worry that may arise with the introduction of editorial discretion is the problem of trust. Facebook was sharply rebuked for clandestinely manipulating users’ news feeds in a psychology experiment last year, so Apple and Twitter will have to prove their reliability and good judgment. How will Apple’s editors handle news unfavorable to Apple, for example, and how inclusive will Twitter’s conversation shapers be when it comes to airing unpopular points of view on a given subject? Still-thriving web communities like Digg and Reddit rely heavily on user participation. These platforms automate only to tally up the popularity of stories among their readers, and then have the moderators vet to ensure quality. Clearly, it’s a a mix of human and machine that helps us distill the web into something digestible. Right now, the momentum seems to be swinging back in favor of the conscious curator, the human that can make decisions for us in order to tame the big, beautiful chaos of the web. Why did the expensive notebook company need to go digital? I almost balked when I saw a calendar app from Moleskine on the App Store. Don’t get me wrong, I absolutely adore Moleskine and collect hordes of them. I have the LEGO edition, the Lord of the Rings edition, the Star Wars edition, the wine journal and the traveller’s journal. And I use none of them because I feel they are so special that they are meant to be treasured and not to be used. There is a sense of pride in using a product that accounts for Hemningway, Picasso and van Gogh as part of its lineage. Unlike the note-writing apps, there is something very intuitive about Moleskine, perhaps as it does not involve learning where to click or where to go and what to do. It is immediate. The idea that non-digital products and ideas have become more valuable may just seem to work against the narrative of disruption-worshipping techno-utopianism coming out of Silicon Valley but, in fact, it simply shows that the evolution of technology is not linear. We may eagerly adopt new solutions, but, in the long run, these endure only if they truly provide us with a better experience—if they can compete with digital technology on a cold, rational level. And therein lies the rub. I find the transformation of Moleskine to its digital avatar at complete odds. Moleskine’s ascent is symptomatic of a shift that I call the revenge of analog, in which certain technologies and processes that have been rendered “obsolete” suddenly show new life and growth, even as the world becomes increasingly driven by digital technology. This goes beyond the well-documented return of vinyl records, encompassing everything from a business-card renaissance sparked by MOO. Interestingly, Evernote, the digital app which competes with Moleskine has opened a marketplace for physical products, including notebooks, special Post-it notes, desk accessories, and even bags with the bestseller product being the Evernote Moleskine. Evernote might have set out to eliminate unorganized stashes of paper notes, but the future is not paperless. You may call it genre-bending or genre-defying or doing away with genre-snobbery, Gaiman and Ishiguro had this most fantastic conversation which you cannot afford to miss. Stories are interesting in that way. They sometimes just emerge, after some mysterious kind of hibernation period. You can never tell what is going to be one of these long-lived creatures and what isn’t. It would be interesting to think, if stories are creatures, whether some of them are actually deceitful creatures. Some of them would be deeply sly and untrustworthy, and some of them would be very uplifting. There is so much to love about this conversation which actually comes as a part of a New Statesman special issue edited by Gaiman and Palmer. The issue was to have a special cover designed by Art Spiegelman but alas. Today marks the beginning of the last few episodes of Mad Men. In an odd-schadenfreude way, Mad Men has been like comfort television for the last seven years though I believe it is largely a show which has been on the wrong side of history. I say that because its a show about terrible things happening to not-so-terrible people. The men and women of Madison Avenue never appear boring because the personal chaos they inhabit mirrors the seismic shifts of the period. Their tension between morality and immorality, stability and anomie, surface and depth is signature romantic. If romantics are anything, we are conflicted. We long for that amber-hued period in the past when work provided a bulwark against all the erupting madness of the world — yet we simultaneously celebrate the moments when fortification fails, exposing fissures across class, gender, and racial lines, revealing to us the allure of messy lives. And it’s also consoling and even a little heartening to remind ourselves that, no matter how they’ve spun it, the people who tried to navigate this world ahead of us didn’t know what the hell they were doing either. So, tonight I raise a toast to Sterling Cooper Draper Pryce! While studying Digital Anthropology, digital divide was a topic which often came up for discussion in the classes. Digital divide which clearly demarcates those with access to technology from those with limited, borrowed or no access to technology. In this context, the stories of Yahoo-Yahoo Boys of Nigeria and the cyber-cafes in Ghana make very interesting reading. 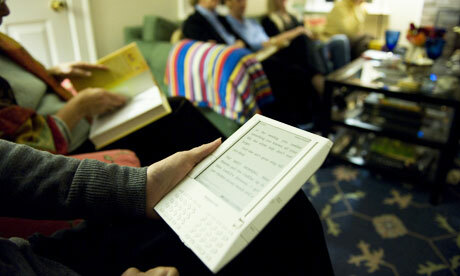 In my own country, digital divide has spawned into new forms of social and cultural equities. So, I was so amused when I read Paul Ford’s ‘It’s kind of cheesy – being green.’ There’s a point in his post where he highlights Tim Cook’s quote from a WWDC event in which he had mocked upon the green bubbles. But are the green bubbles really ugly? Ford highlights how these are purely product decisions clearly in this case, to make the ‘iDevice’ user stand out from the rest. It’s now even a selling point! However, what appears stranger to me is the fact that the icon for Messages in the iOS universe is green and not blue. It’s a little thing, so very little, but it matters. Perhaps, one small factor among many that allow the iPhone to sustain higher prices and margins and for people and societies to form opinions. There are many studies which show consumer decision making gets strongly anchored to a product or an association as an effect of colours. The whole business around cherry-picking colours for different product attributes is now so well-entrenched industry trend, that Pantone, the proprietary colour-standardization company, has been for a couple of years has been selecting ‘colour of the year’ to influence design and product decisions from fashion to home, and packaging to interactive design. How they pick the colour of the year makes another very interesting story. 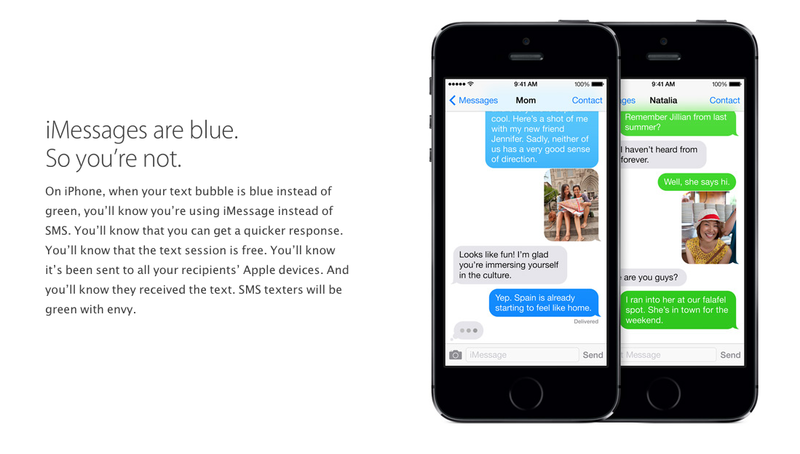 As a final word, I don’t think Apple did the iMessage colour coding on purpose but the decision around selecting blue over green has led to multiple ramifications impacting societal and cultural norms.